October 03, 2018, 8:53 a.m. In the past, YouGov and SMG Insight has discussed both the growth of eSports as an industry, and how the sport would be attractive to potential gamblers. 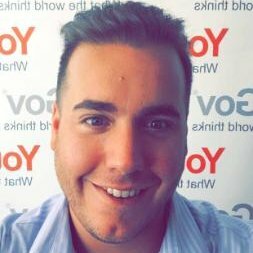 Now, new research data from YouGov/SMG SportsIndex indicates how eSports favourites such as the ‘Overwatch League’ is continuing to challenge long-established traditional sports in terms of Word of Mouth Exposure score. A sporting property’s WOM score measures whether somebody has discussed the sport with a friend, family member or colleague. In this case, YouGov/SMG SportsIndex looked at the WOM score among those that are aware of the sport. 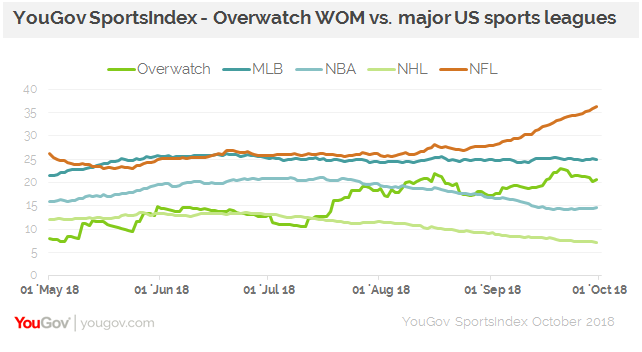 During the Overwatch League, among those that are aware of it, its WOM score jumped significantly (up to around 19%), and put it close to the level achieved by the NBA. Now, Overwatch isn’t nearly as widely known as the NFL (to pick one established sport), but what our data may give us is a glimpse into the future of eSports – one where once they become more familiar to the general public, eSports begin to give traditional sports a run for their money. It’s a vision of the future that many in established sports have already bought into, with the NFL, NBA and MLS already building eSports brands to buttress their on-field offerings. And many eSports fans are firmly on board – our Profiles data tells us that 17% of them believe that video games should be taken just as seriously as football, baseball and the rest. There’s certainly a virtuous circle – we know, for example, that NBA fans are almost twice as likely to be aware of the league’s eSports partner, NBA 2K, than the general public. They are also more than twice as likely to have a positive impression of the video game. And in general there is no divide between eSports fans and fans of America’s big four sports. A fan of traditional sports is just as likely (and sometimes more likely) to have a positive view of eSports including Fortnite, Overwatch and NBA 2K. There’s no ‘them and us’ when it comes to sports and eSports. But while the smart money may well be on the mainstreaming of video gaming into US sports culture – and on the co-opting of eSports ‘cool’ by brands and rights holders – most Americans also recognize that eSports is not yet ready for the global Olympics stage. When it comes to being part of the Olympic program, as the IOC is exploring, only one in five eSports fans believe video gaming should be included. Amongst the general public, that figure falls to just 13%. For the time being at least, it feels like the integration of eSports and traditional sports has its limits – even if they have not yet been fully explored.